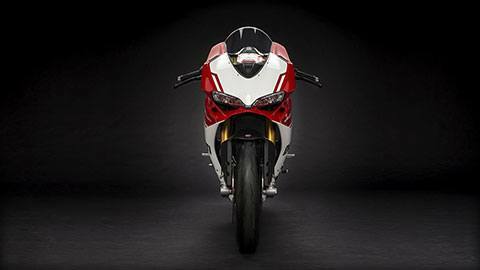 This is the celebration of the twin cylinder Ducati Superbike legacy. 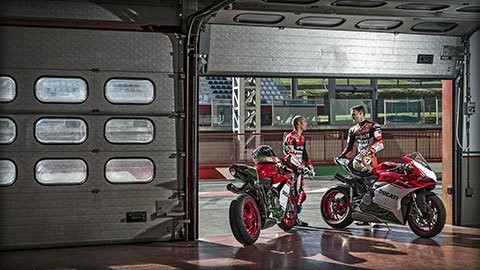 We combined the most advanced aluminium monocoque chassis with our most powerful Superquadro engine to create the Panigale 1299 R Final Edition. 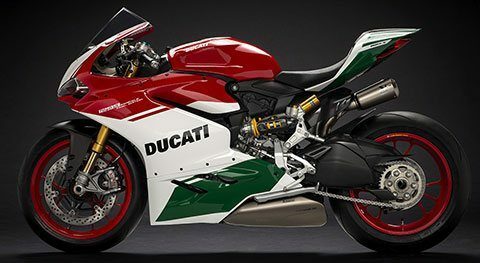 For passionate riders ready to own the strongest part of Ducati's V-twin history, complete with celebratory livery and numbered billet top yoke. 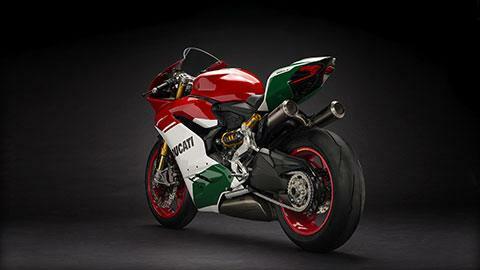 BRAKES: The 1299 Panigale R Final Edition features the finest brakes available - Brembo's M50 Monoblock calipers. Sporting an extremely compact design and machined out of a single alloy block, the M50 calipers offer the ultimate in rigidity and deformation resistance during extreme braking. TIRES: All large-displacement Panigales benefit from Pirelli's Diablo Supercorsa SP tires, the road version of the tire used in the Superstock 1000 World Championship: 120/70 ZR17 at front and 200/55 x ZR17 at rear, which provide the contact patch necessary to effectively transmit the Superquadro's power to the ground. Designed to maintain a precise line in straights and on curves, the rear 200/55 x ZR17 tire maximizes the area of contact and corner speed by combining 200 mm width with a high profile. 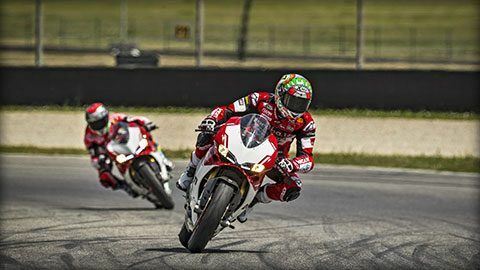 The tires have structures and compounds deriving directly from Pirelli's experience in the Superbike World Championship, and feature casings specially studied to guarantee rigidity in extreme braking and shoulders that maximize the contact patch. In addition, a special double compound that uses the most advanced polymers facilitates the rapid heating of the tires together with a constant grip. 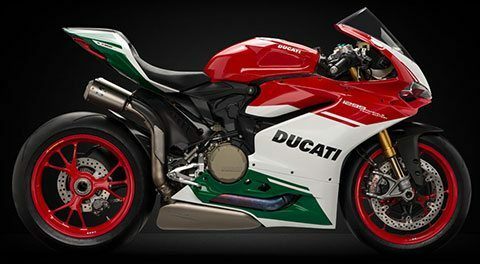 FORGED WHEELS: The 1299 Panigale R Final Edition features red colored Marchesini tri-Y spoke forged aluminum wheels for unmatched lightweight and a racing look. ÖHLINS MECHANICAL SUSPENSION: True to the Panigale R's racing focus, it features competition oriented Ohlins suspension including an NIX30 fork, TTX36 shock, and steering damper, all fully manually adjustable. This system provides competition-level damping and vehicle control, while being lighter than an electronic system - contributing towards the Panigale R's incredible weight advantage over the competition. 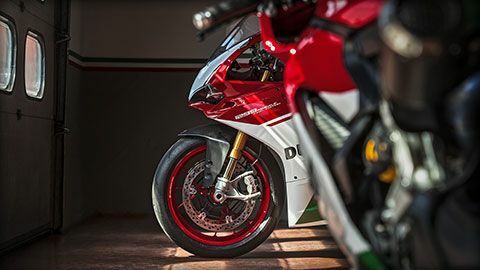 MONOCOQUE TECHNOLOGY: The 1299 Panigale R Final Edition's monocoque chassis forms its structural backbone - compact, rigid, lightweight, and multi-functional. Cast in aluminum, it attaches at its rear directly to the heads of the Superquadro engine and contains the steering head and bearings at its front. In addition to performing the function of a traditional frame, the monocoque also serves as the airbox and in this way significantly contributes to lowering the overall weight of the motorcycle. Housed inside it are the air filter, throttle bodies and fuel circuit complete with injectors, making it truly unique and a revolutionary advancement to the world of traditional motorcycle construction. EXTREME BORE / STROKE RATIO: The Superquadro engine's bore/stroke ratio of 1.91:1 sets an extreme example of the power-maximizing ""oversquare"" architecture used in the world's most advanced racing engines. 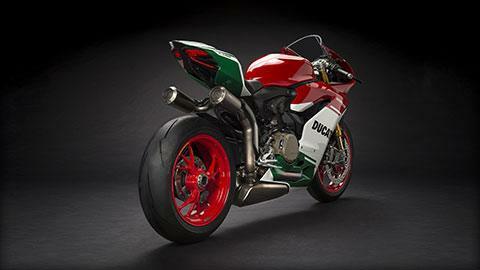 A short-stroke crankshaft and enormous pistons combined with large Desmodromically-actuated valves allow the Superquadro to breathe freely at high rpm, while a 1285cc combustion chamber ensures the ample torque that has made so many enthusiasts fall in love with Ducati's signature L-twin power. HIGH TECH INTAKE: The Superquadro engine uses large intake valves fed by advanced oval-section throttle bodies, with different height inlet ducts for front and rear cylinder, which emphasize high air flow for maximum power production. Independently controlled by the fully Ride-by-Wire system, the throttle bodies are each fitted with 2 fuel injectors: the first is set below the body and operates in lower rpm/load conditions, while the second is fitted above the throttle body and is called into action when it's time for the Superquadro to unleash the full scope of its power and torque. 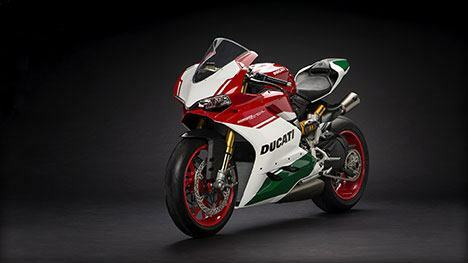 POWER AND TECHNOLOGY: The Superquadro engine in the Final Edition is based on the 1299 Superleggera engine and has a maximum power output of 209 hp at 11,000 rpm and maximum torque of 142.0 Nm (104.7 ft. lb.) at 9,000 rpm. 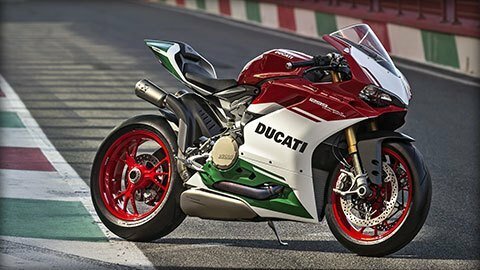 The engine is fully street legal with Euro 4 homologation and employs a lightened crankshaft with tungsten counterweights and a larger crank pin than on the standard 1299 Panigale. The conrods and valves are made of lightweight titanium, the cylinder liners are steel and the 2 segments pistons have a diameter of 116 mm. DECOMPRESSOR: At the end of the exhaust camshaft of each cylinder head is a centrifugal decompressor. On start-up, this device allows the profile of the cam opening lobe to be modified, slightly lifting a valve so that part of the combustion charge can escape the chamber during the engine's compression phase. Once the engine fires, the increase in rpm and associated centrifugal force modify the decompressor, cancelling the valve lift effect to bring the engine to normal operating conditions. By temporarily reducing the compression effect of the piston during start-up, a much smaller and lighter starter motor and battery can be used, contributing significantly to the extreme light weight of the overall engine and motorcycle. This ingenious system further underlines the synergistic strength achieved by engineers and designers in the uncompromising creation of the Superquadro. TRANSMISSION: During development of the first Superquadro engine, Ducati engineers took their design freedom to the limit by increasing the distance between centers of the six-speed gearbox shafts and allowing the use of gears with an increased diameter and superior strength for the transmission of power. The oil bath clutch, similar in design to that used on other Ducati models, is a progressive system which allows the load on its plates to be increased without increasing the effort required by the rider to pull the lever and disengage the clutch. This optimally satisfies the need for a high torque transmission which still provides optimum usability for the rider. In sport riding conditions with abrupt downshifting heavy engine braking, the same mechanism reduces the pressure on clutch plates and allows them to slip as in a racing system, preventing a loss of stability in the rear end and offering excellent modulability during hard braking into corners. OPTIMIZED GEOMETRY: The 1299 Panigale R Final Edition benefits from the experience of Ducati Corse, adopting geometry which uses a 24° steering head angle along with a low swingarm pivot point. This enhances the bike's agility, and provides excellent rear traction in a wide variety of conditions. 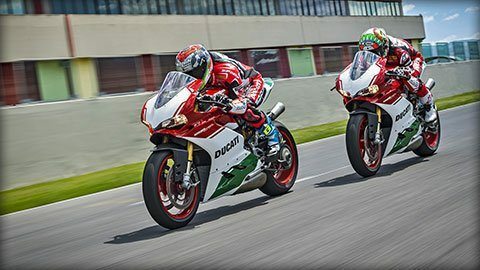 TOTAL CONTROL: Thanks to Ducati's Riding Modes, riders can instantly vary key characteristics of the 1299 Panigale R Final Edition to suit different conditions or preferences - engine power and delivery, traction control, wheelie control, ABS, engine braking, and suspension behavior. Three pre-set configurations, Race, Sport, and Wet, are available to be selected by using buttons mounted on the handlebar. But these are only a starting point, as each configuration's individual control parameters can be set to the specific level desired by the rider. With three custom setups ready at the push of a button, the 1299 Panigale R Final Edition becomes a perfectly tailored partner to the rider's unrelenting pursuit of speed. ANTI-LOCK BRAKING SYSTEM (ABS) 9.1 MP: The Bosch 9.1 MP ABS equips the 1299 Panigale R Final Edition as standard, and is a latest-generation system that performs combined braking with control rear wheel lift to guarantee the shortest braking distances and greatest stability in any conditions. Further, the system interfaces with the Bosch Inertial Control platform, allowing maximum braking even while the motorcycle is leaned over. 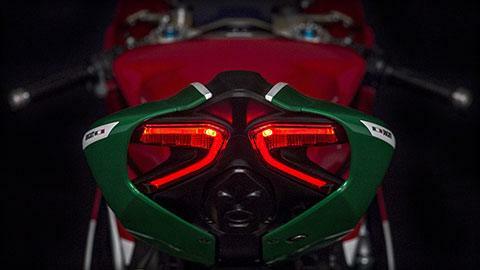 FULL TFT INSTRUMENT PANEL: The instrument panel on the 1299 Panigale uses a full TFT display. The color display's configuration is variable and automatically adapts to variations in environmental light and to the selected Riding Mode. In the "Road" and "Wet" Riding Modes, speed takes center stage and is displayed in large numbers in the middle of the display, whereas the two boxes containing "supplementary information" underneath provide data on total mileage and engine coolant temperature. In the "Race" Riding Mode, the display layout is automatically reconfigured, shifting the display of the vehicle's speed in the lower information box at left and making room for the last lap time, centrally displayed in large numbers. 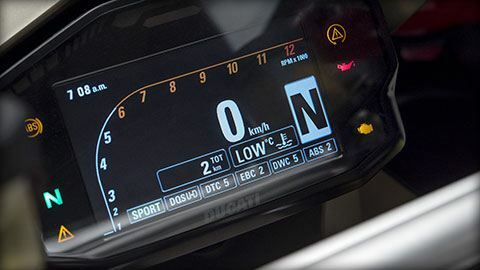 For the first time on a Ducati motorcycle, the display features a "lean angle visualization," allowing the rider to see their achieved lean angle displayed on the dash in real-time. DUCATI QUICK SHIFT UP / DOWN (DQS): The Ducati Quick Shift up/down (DQS) is a race-derived electronic system that manages shifting of the gearbox in both up and down directions. It allows upshifts to be made under full acceleration without using the clutch, which gains precious fractions of a second that would otherwise be wasted in closing the throttle. It also allows clutchless downshifts, as the system performs a perfectly-timed auto-blip when the foot lever is depressed, engaging the gears smoothly and allowing the rider to concentrate only on braking and corner entry. 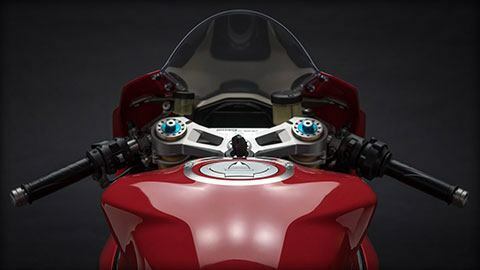 AUXILIARY HANDLEBAR BUTTONS: The 1299 Panigale R Final Edition features handlebar-mounted auxiliary control buttons, which allow the rider on-the-fly adjustment of a selected parameter among DTC, DWC, or EBC. Using these the rider can instantly fine-tune the motorcycle to changing track, road, weather, or tire conditions without slowing down. 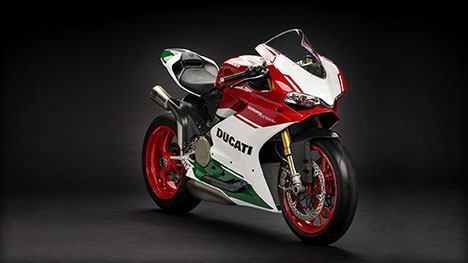 LITHIUM-ION BATTERY: The 1299 Panigale R Final Edition uses the lightest and most advanced battery technology available, Lithium-ion. This allows it to save over 2 kg compared to a normal battery. HOMOLOGATED AKRAPOVIC TITANIUM EXHAUST: The homologated Akrapovic titanium exhaust, complete with twin titanium silencers and titanium exhaust manifolds, replicates the look of the World Superbike Panigale exhaust. 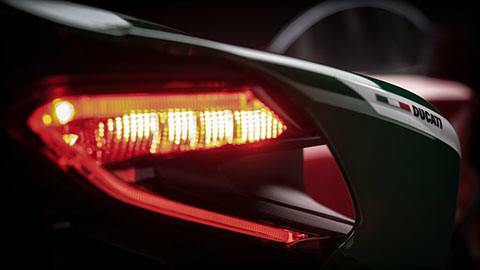 It allows the engine maximum breathing and maximum power, while guaranteeing significant weight saving. DDA + GPS READY: The DDA+ GPS (Ducati Data Analyzer) is fitted as standard and integrates a GPS signal to create a "virtual finish line". The system automatically detects, without any intervention by the rider, the conclusion of the lap and stops the chronometric time. Integration with the GPS signal also provides visualization on the circuit map of the trajectories ridden and the main parameters of the vehicle: throttle opening, speed, rpm, gear engaged, engine temperature, DTC activation, and lean angle. 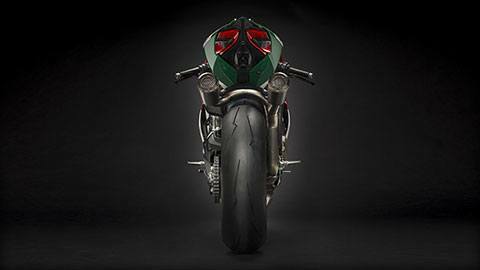 CARBON PARTS: The 1299 Panigale R Final Edition includes several components in the highest quality carbon fiber - front and rear mudguards, heel guards, and a shock cover - to accentuate its high-technology and premium nature. 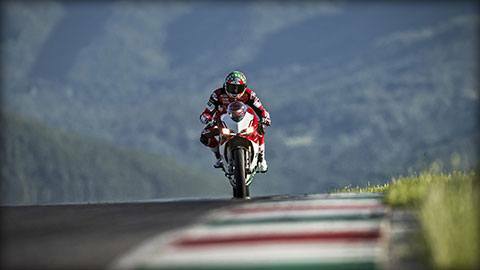 Light and stiff, carbon fiber saves precious grams of weight compared to an equivalent part in plastic, enhancing the Panigale 1299 Panigale R Final Edition's performance in pursuit of the fastest time on track. ENGINE BRAKING CONTROL (EBC): The engine braking control (EBC) system works in combination with the slipper clutch to prevent and manage any locking of the rear wheel during aggressive downshifting. The rider can select the level of engine braking felt from one of 3 levels, allowing them to perfectly customize the motorcycle's feeling during deceleration and turn entry. 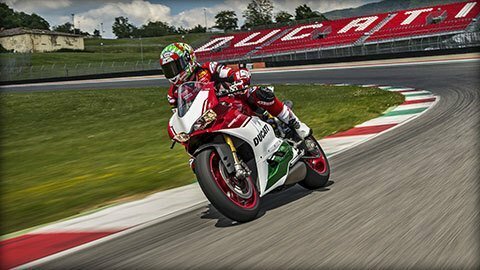 DUCATI TRACTION CONTROL EVO (DTC EVO): Ducati Traction Control (DTC) EVO is an advanced system that uses information from the Bosch IMU to monitor and maintain control over slipping of the rear tire. It operates on the basis of eight different levels of intervention, each of which has been programmed to respond to a different tolerance to rear slipping. Each Riding Mode is assigned a preset level of activation, which can then be modified according to the riders' desire. Level 8 corresponds to an activation of the system with the slightest slipping, while Level 1, best used by expert riders and professionals, has a higher tolerance and thus allows a much higher amount of slip before intervening. BOSCH INERTIAL PLATFORM: The 1299 Panigale R Final Edition uses the Bosch Inertial Platform, which is centered around an Inertial Measurement Unit (IMU). The IMU constantly monitors the motorcycle's lean angle and fore/aft pitch, interfacing with the ABS, DTC Evo and DWC Evo, ensuring that these systems operate at maximum effectiveness regardless of the motorcycle's position. Front - 3-spoke W shape forged light alloy 3.5 x 17 in. Rear - 3 spoke W shape forged light alloy 6 x 17 in.